Even before we had land of our own, we started raising chickens with some friends on their property. We knew we wanted a dual-purpose, heritage breed and tried out a few before settling on Dominique chickens. Later we got into ducks, mostly as a way to control our garden slug problem! Again we tried a few breeds, then settled on Indian Runners. We have breeding flocks of both, raising and selecting for health, vigor, broodiness, and good conformation to breed standards – in that order of priority. 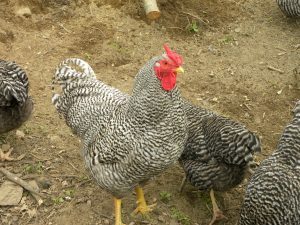 The Dominique, America’s first chicken breed, was developed here in New England by the settlers in the 1700s. The exact origin of the breed is unknown at this point and it’s conservancy status is at the level of “watch” now. Dominiques are great at dealing with our winters – they have small “rose combs” that are less susceptible to frostbite than large single combs, and close feathering which keeps them warm. They have a black and white pattern which helps them blend in with the environment – good for an area with lots of predators like we have out here! They are great egg layers and big enough to be useful for meat. They are calm tempered and good foragers. We love them! The reason we branched out beyond chickens was simply: slugs. When we established a garden on our land (which does have some swampy spots) it was nearly overrun with slugs. It was a rainy spring as well, and they were on everything – not just greens and tender crops, but even garlic and onions! I could fill a quart container in 15 minutes (yes, I hand-picked the slimy little beasts!). I would then bring them to the chickens, who would just look at me and walk away, letting the slugs ooze back to the garden. Squishing slugs was no fun, either. 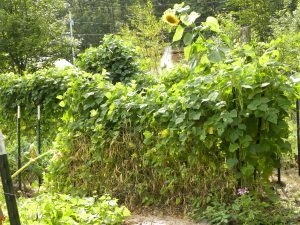 Then I remembered the permaculture tale of Bill Mollison telling someone that they did not have a slug problem, they had a duck deficiency. And so, we got ducks. 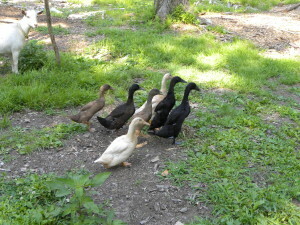 We have tried three kinds of ducks: We started with Indian Runners, but have also tried Muscovies and Khaki Campbells. 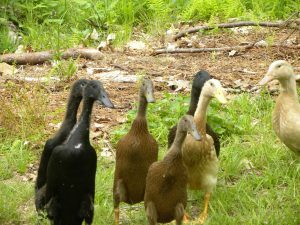 The Khaki Campbells couldn’t really keep up with our running Runners, and we weren’t succeeding with getting our Muscovies to raise as many ducklings as they are known to do. So, we downsized to just the Indian Runners for now. 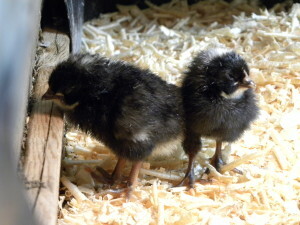 Indian Runners are a small, egg-laying breed. They are excitable, and they stick together – which makes them actually herd-able, which is what they have been selected for over 2,000 years. They were bred in Asia to be ushered in and out of fields and patties to clean up crop residue, weed seeds, and bugs. And, yes, they love to eat slugs! They are also easier on a garden, so I can actually let them in periodically to do some foraging themselves. 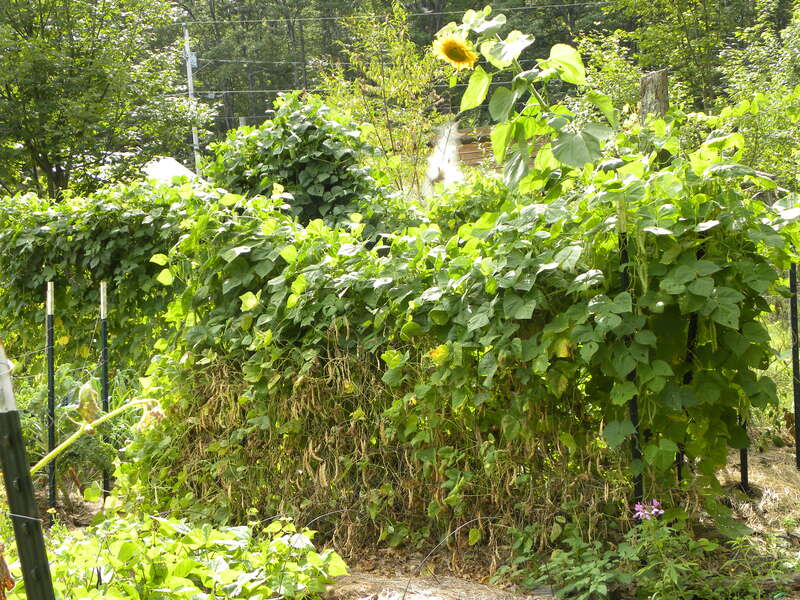 The chickens on the other hand would destroy the garden in minutes. 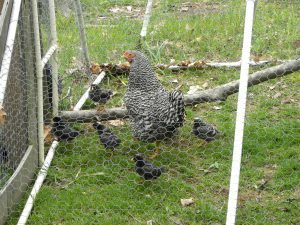 After a few years of keeping poultry and hearing unfavorable stories about the practices and hygiene at big hatcheries (and having our own problems with mailed chicks), we started doing our own breeding. 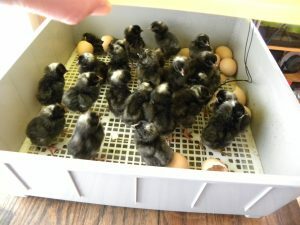 When we have broody hens we gladly let them do some of this work, but we also use an incubator so that we can provide some chicks to local people as well. We have been really pleased with the health and happiness we have found in the birds we hatch out here. We are also pleased to be part of the line of people who have focused on specific breeds to keep them healthy and productive and beautiful!